Brought to you by the same people who introduced Gmail, this tool offers a new way to organize your mail, pins and reminders and is a ‘New Generation’ inbox which has been aptly designed to focus on things that matter the most. 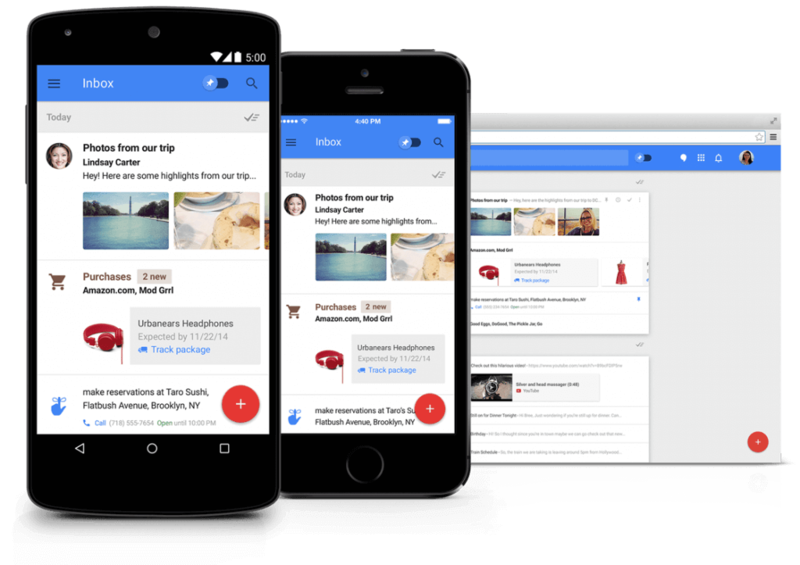 Basically displaying a To-Do list, what Google Inbox does is that is categorizes every email that you receive as important and less important emails. The Inbox app’s design is quite simple and clean and it has a clear influence from Android Lollipop’s latest material design. The inbox is in chronological order with today’s messages always on top. The bottom screen shows a compose button. *Inbox is currently available for personal gmail account holders only and is not yet available for corporate account holders. Why is it different from Gmail? The latest version of Gmail from 2013 consisted of a tabbed inbox where your emails were automatically grouped into labels such as ‘promotions’, ‘social’ etc. Inbox is a step further with a brand new approach which offers more labels such as finance, travel, purchases etc. The main reason being to help remove clutter from the users email. Inbox is remarkably fast and smooth on all kinds of platforms. Bundles – Promotional emails, finance, social, updates, travel are grouped together in their own ‘bundle’ which can be expanded or dismissed accordingly. You can also create your own bundle and place the emails in dedicated sections. The set up process is similar to creating a new Gmail filter. Highlights – Inbox makes it a point to highlight the key information from important emails which can be anything from flight details to photos and event information. Usually bundles and highlights work together to provide you with the information you need to see at one glance. Swipe Away – Inbox simply uses swiping which helps you to manage your email faster. You can swipe right to mark a message as done and archive it or swipe left to snooze it. Assists, Reminders and Snooze – Inbox makes it easy for you to focus on the most important tasks that you have and need to do. You can create your own reminders as and when you want. The app will also provide you with a number of Assists from providing contact information to offering a link to check in when booking a flight online. You can also snooze the reminders to deal with them later when time permits. The Giveaway – Get Free Invites for lucky ceffectz followers! Follow these simple steps and stand a chance to win a Google inbox invite. Send PM to Facebook or Twitter by describing why you need the invitation desperately. Extended due to the higher demand, Offer Ends 5th November 2014, Hurry before its too late!